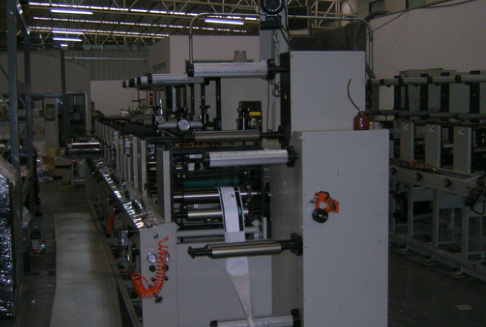 Employing micro-processor controlled, fully automatic roll transfer systems to produce multi-roll jobs, or a continuous series of single-roll jobs, without stopping or slowing the press for roll changeover. No need to continuously monitor rewinding operations; production flows without interruption, saving paper and man-hours. Press restart adjustments are eliminated. Exceptionally easy to set-up and run; a color touch-screen walks the operator through. Requires no change in production methods and no modification of associated equipment - nonstop roll changer ideal for mid to wide-web printing, laminating and converting processes. Provides continuous roll-to-roll productivity for a wide range of applications and materials from film to paper and paperboard. Winds, automatically changes and automatically unloads full rolls. This servo motor controlled design minimizes the tension upsets by slowly accelerating and decelerating the rotation of the turret. When specified footage has been rewound, or upon a signal from the press (or operator), the web is transferred from the full roll to the empty core - without stopping or slowing the process. The finished roll is then lowered to the floor level for delivery. Enclosed for safety while enabling the operator to view all functions of the rewind. Versatile – accommodates design features to meet specific material and process requirements.